Éclairs always remind me of our “female” family gets togethers. Auntie A is on her way round, then maybe auntie B will follow suit an hour or so later and she’ll bring the custard tarts from Tesco’s whilst we might provide the fresh cream and jam doughnuts from Morrison’s. Auntie A will be pouring the stovetop Turkish Tea into our tiny glass vessels in abundance and there will always be a whiff of brewed cloves to be smelt in the air. There’s nothing wrong with sharing and enjoying something sweet and mass packaged whilst having a good old moan from time to time, don’t you think? Most of our teatime favourites have one thing in common and that’s sweetened whipped cream, with added gelatin to help thicken and plump things up a bit and worryingly prolong its shelf life. Sickening, really, how processed cream can taste so damn good. But it’s the beginning of April, dissertation deadline is looming so I’m steering clear of processed cream, hoping it will promote– a ‘can do’ attitude (still cant do). 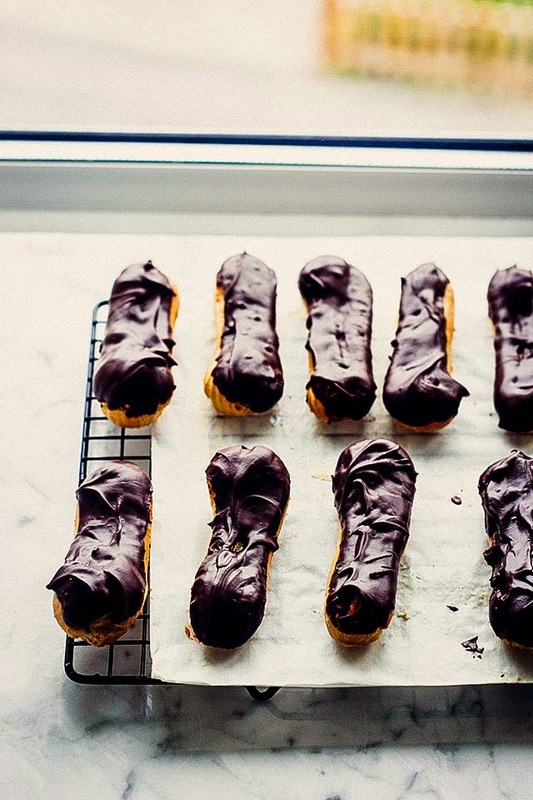 The filling in these éclairs isn’t made with coconut milk residue. Make them with a cream with the highest fat content you can find, sugar and a touch of rum to round off the sweetness. It’ll take you back to the best bitching session you’ve ever had with your family. Preheat the oven to 170 C and line a large baking sheet with baking paper or lightly grease with a knob of butter (either works!). 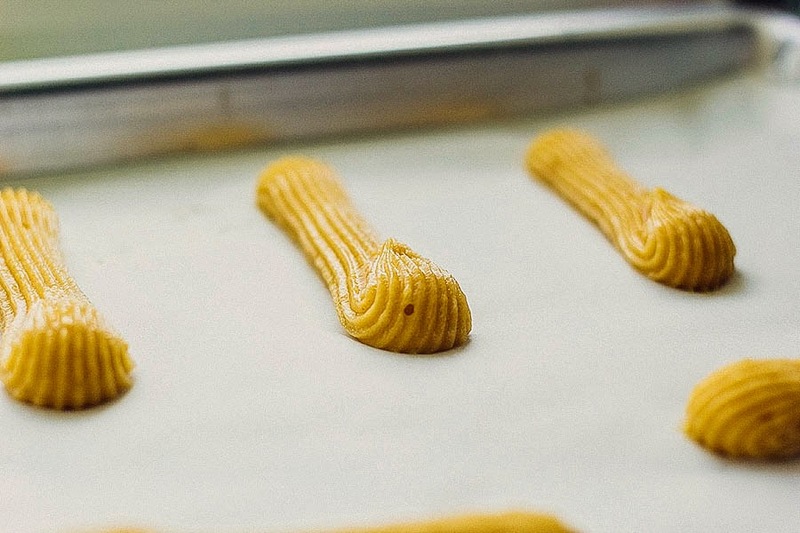 Make the choux. Bring the butter, salt and water to the boil on a medium heat. 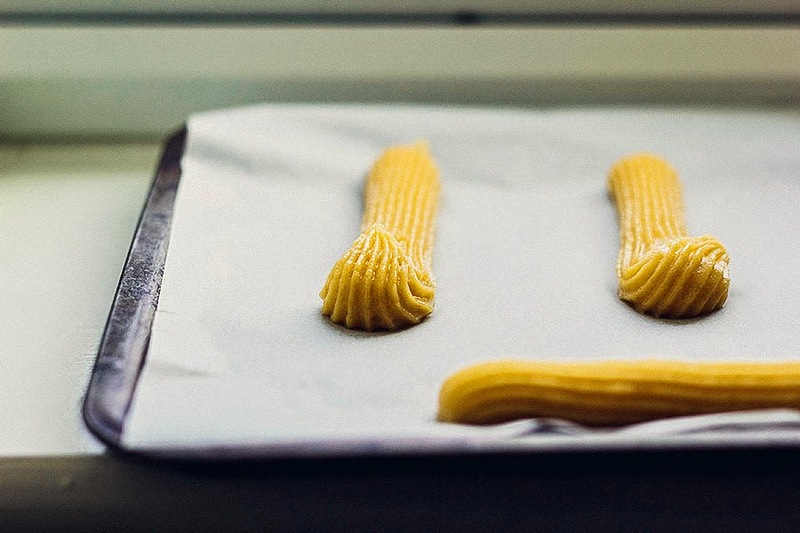 Once the butter has melted, gradually tip the flour in. Whisk vigorously until a ball forms. Switch to a wooden spoon and beat the dough until it no longer sticks to the sides of the pan and then cook through for one minute. Transfer to a freestanding mixture fitted with the paddle attachment (or grab an electric whisk) and beat another minute on medium speed. Add the eggs one at a time until you reach a glossy and pipe-able mixture. Spoon the mixture into a piping bag fitted with a large French or round nozzle. Pipe 10-12cm lines spaced two inches apart, pull the piping bag against the raw éclair, almost flicking the end back into it (re photo). Bake for 15 minutes or until they’re puffed up and golden. Open the oven door for the last four minutes to let out the steam. Let cool completely. Take a small French nozzle and carve three holes out of the bottom of the éclairs using the tines of the nozzle (or poke with a sharp knife). Fit a piping bag with the same nozzle. Whip the cream, sugar and rum until soft peaks form and spoon into the piping bag. 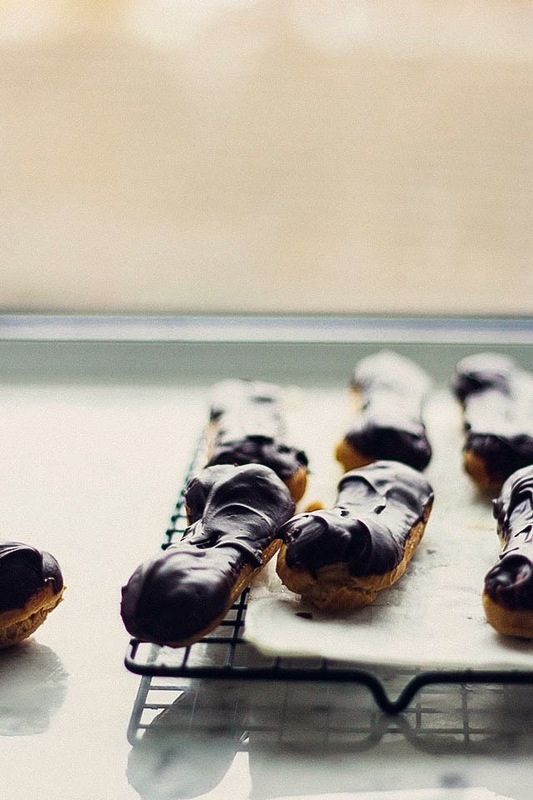 Gently squeeze the filling into the éclairs by filling from the holes made earlier. Make the chocolate. 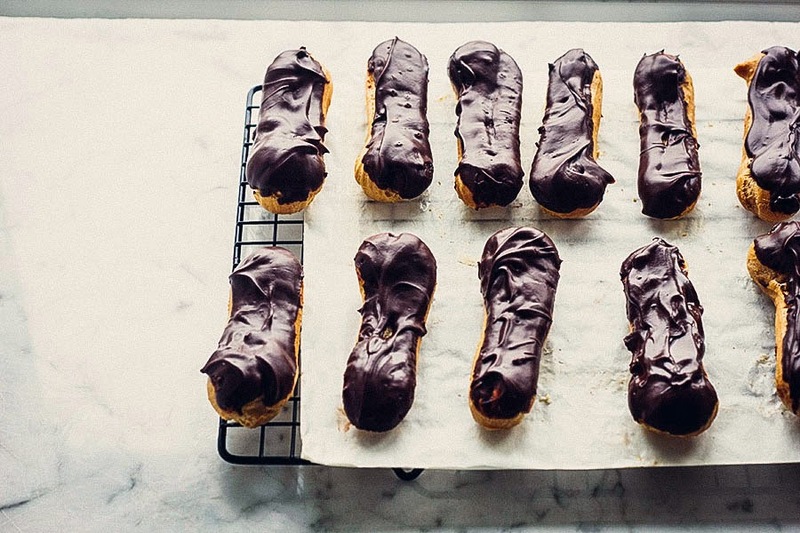 Place the chocolate and butter into a microwavable bowl big enough to dip the éclairs in. Melt the mixture in the mic and then stir in the cream. Reheat to loosen the chocolate if it becomes stiff, keep doing this if you need to. 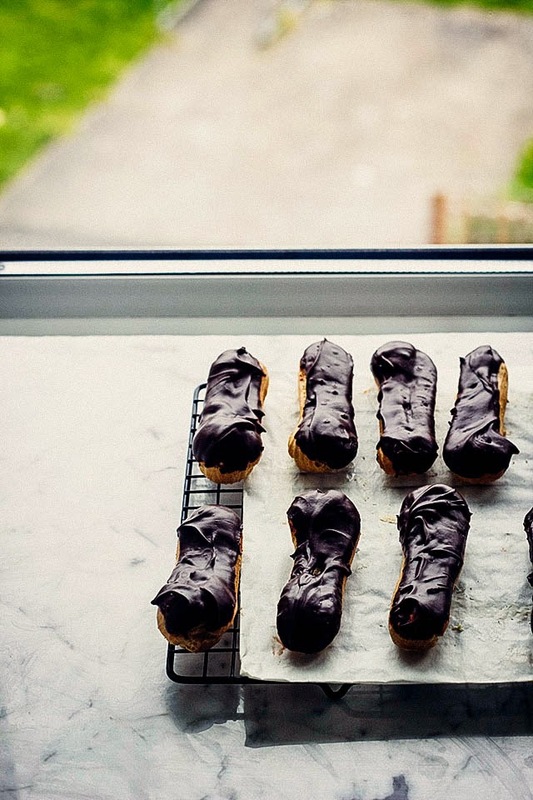 Dip the éclairs into the chocolate until half coated, shake twice to run off excess chocolate then place on drying rack. Leave to set. Store in the fridge, covered for three days max. 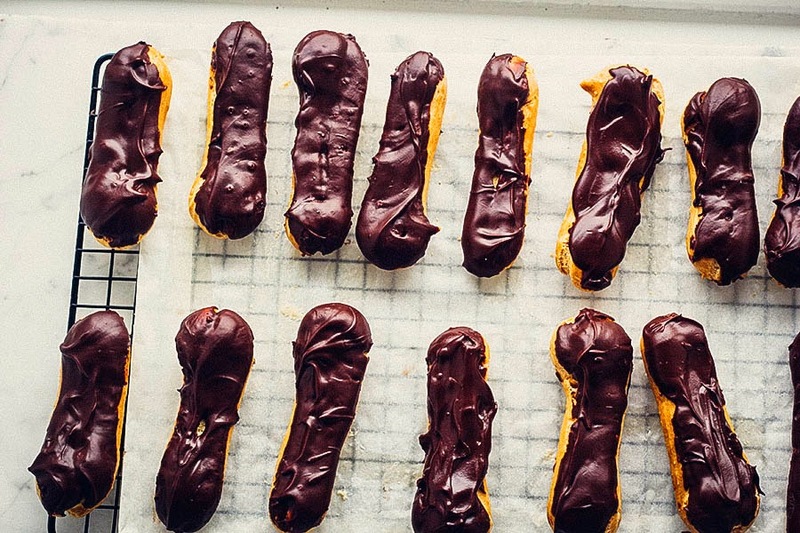 I am so impressed with anyone who attempts to make their own eclairs! In fact, that's rude of me to say 'attempt' because these obviously turned out fabulously! Love your photos, as well! I have a 'can do' attitude. 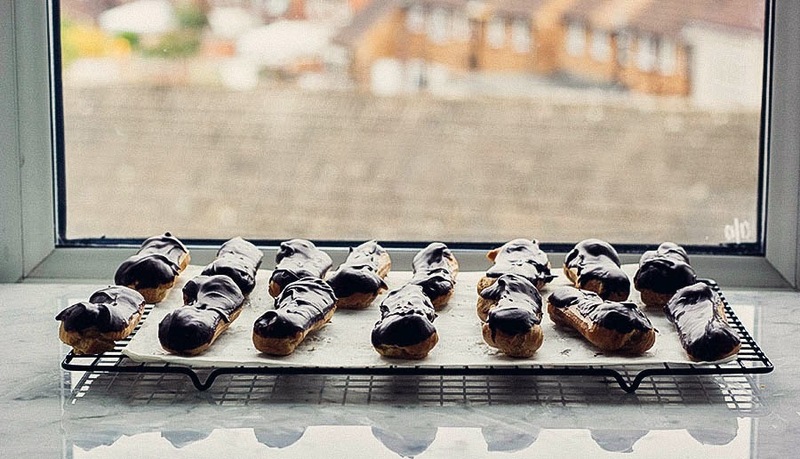 For example, when I think about eating literally ALL of these eclairs, I'm immediately like CAN DO. You just gotta believe in your dreams, ya know? Haha, for that exact reason, I'm kinda glad I left the majority at my sisters! I basically dont dream bigger than pastry if im honest Sarah !